1) Hopefully you have used two different colors of acrylic paint on your cardstock, but what ever you have will be fine. [She let us know to do this ahead of time]. 2) You will need to use at least three (3) pictures. 3) Use three (3) embellies of your choice. 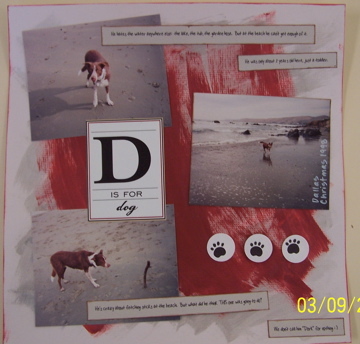 4) Journaling: use four (4) journaling strips. This is an option, not necessary, but it might be something to try if you haven’t done it before: write on at least one of your pictures using a pen or computer. The writing must be visible, not hidden. You can put a date, event, person’s name, a cute saying, etc. If you do this option, your name will go in the hat two times. This is my LO and I had fun making it, and I hope you do too. This is my DS in 1970. I used my MM Tag Maker to make one of my embellies, and I put a piece of the pp inside. Great job with these two challenges Erika! THat story about the girl in the hospital breaks my heart!